Don’t dump aquatic plants in the wild – you could be breaking the law. Some plants can become invasive and damage the environment. 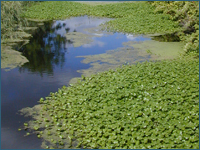 It is important that invasive aquatic plants are disposed of responsibly. .Compost or green waste only – you should always dispose of plants by composting them or using your local green waste. Never place them in a nearby pond or waterway – this could be illegal and the plants can spread in the wild. 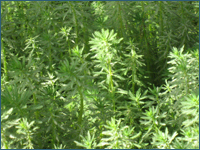 Control invasive species with care – where possible, hand pick invasive plants from your pond. If you choose to use herbicides when controlling an invasive aquatic species, make sure you read all of the product label and adhere to all recommended health and safety guidelines. Remember that some herbicides will not be suitable for use in water. If in doubt, do not proceed with herbicide use. 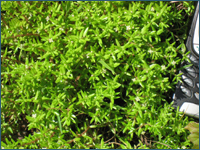 Report – if you come across an invasive plant in your pond or elsewhere you can report its location through the Report a Sighting section of this website . This helps scientists to understand the distribution and spread of invasive species. 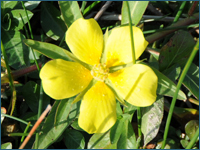 Find out more – if you find you have an invasive plant and want to remove it, act quickly to find out more about what you can do to manage the species. Waiting a few weeks or months could allow the plant to become more established and spread. Remove every last bit – some invasive species can re-grow from tiny fragments, so try to remove every last bit. You won’t always get everything so make sure to check for re-growth in the following season and remove new plants as necessary. Time your work – problem plants can be pulled out at anytime, but big clearouts should be saved for autumn, when they will cause the least disturbance to your pond and any associated wildlife. Clean your kit – make sure to clean your footwear and equipment when removing unwanted plants. Tiny fragments could be carried on them and regrow. Don’t spread plants with your waste water – any waste pond water should be emptied away from streams, rivers, ponds, lakes or drains that flow into them. You could use the excess water on the lawn or to water plants in your garden. Just be careful and avoid damp areas. Protect pond life – before disposing of plants leave them for a few hours beside the pond, so that invertebrates and animals can return to the pond. Don’t dump your plants in the wild – if you dump any of your aquatic plants in the wild you could be breaking the law. Tips for dealing with five invasive plants that are causing problems & as of the 3rd August 2017 are now banned from sale. Getting rid of some of the worst invasive species can take some time and a number of growing seasons. It is important to remove as much of the plant material as possible, while avoiding breaking it into many small pieces which could encourage spread. By regularly checking for and removing re-growth you should be able to keep these plants under control. Here are some tips for controlling five problem plants. In short: Repeated cutting / pulling is usually necessary. You’ll need to re-visit and regularly clear out any new growth. Floating Pennywort is difficult to control due to its rapid growth rates (up to 20cm per day!) and its ability to re-grow from a small fragment. Regular cutting from May-October will prevent complete dominance and so help manage this plant. Cut material needs to be removed from the water immediately. Hand pulling (or spot chemical treatment) should follow cutting to reduce re-growth. Pulling is likely to work best on small infestations rather than larger areas. Chemical treatment should only be used at the end of the growing season when all other plants have died back. In short: Uproot it manually as soon as you notice it. Regular cutting (at least every 6-9 weeks during the growing season – cut more frequently if necessary) will help to weaken the plant. In your garden pond you can thin using a rake. Cut material must be removed from the water as soon as possible and all fragments need to be removed to prevent re-growth (or spread downstream if you are clearing an area of river). Careful pulling out of stems by hand after cutting will help eradicate it. In short: Pull it out as soon as you see it. You’ll need to re-visit and regularly clear out any new growth. Early and regular treatment is highly recommended. 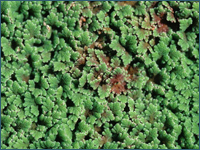 In small ponds, regular pulling out of the plant may be an effective control technique. New Zealand pigmyweed does seem to be less vigorous in ponds with plants that provide some shade. Shading by covering with black polythene for at least three months during the growing season can also be effective, although this will have adverse effects on other species in the pond. While herbicides can be used to help control this plant, they should only be used in winter months when all other plants have died back. However, any use of herbicide in ponds will cause damage to other species and should only be undertaken where pigmyweed has completely invaded the pond. Persons using herbicides must ensure they are fully aware of health and safety procedures and are compliant with environmental legislation. Always read the label. Early removal is essential if this plant is to be controlled. Try to remove all plant fragments and roots, otherwise re-infestation may occur. Regular clearing may be required to deal with re-growth. In short: Remove from the surface of your pond with a net before spores are released (spores are released at the beginning of winter or once dense mats have formed). The easiest way to ensure you get all of the plant matter out of your pond is to scoop it up with a net. The RHS suggest that by disturbing the water surface, fountains may help to reduce infestations. In larger ponds and lakes, a floating boom can be used to sweep the water surface. Complete control is very difficult and so repeated clearance will be necessary. It is important to attempt control before the spores are released (at the beginning of winter, or once dense mats have formed). If spores have already been released then be extra vigilant the following year to catch re-infestation early.